Our client wanted to launch their successful salon-only hair extensions product into a wider market, targeting Europe and the general public. To reflect this change, we carefully changed the existing branding to include ‘Europe’. 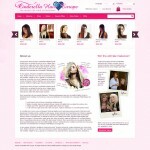 Then we created an engaging, exciting new website design, aiming for the celebrity fashion demographic. Including an easy to use and intuitive navigation style and incorporating existing twitter accounts into the design ensures that this website will become fully interactive with their audience and will secure return visitors. With this new website design, we aim to make it easier than ever for our client to increase sales and grow their online brand.